In large bowl, beat granulated sugar, brown sugar, butter, 1 teaspoon orange peel, 2 tablespoons orange juice and the egg with electric mixer on medium speed, or mix with spoon. Stir in flour, baking soda and salt. Stir in cranberries and nuts. Drop dough by rounded tablespoonfuls about 2 inches apart onto cookie sheet. Bake 12 to 14 minutes or until edges and bottoms of cookies are light golden brown. Remove from cookie sheet to cooling rack. Cool completely, about 30 minutes. In small bowl, stir all frosting ingredients until smooth and spreadable. Frost cookies. Save time and lower the calories! Skip the frosting, and dust cookies and serving plate with powdered sugar. 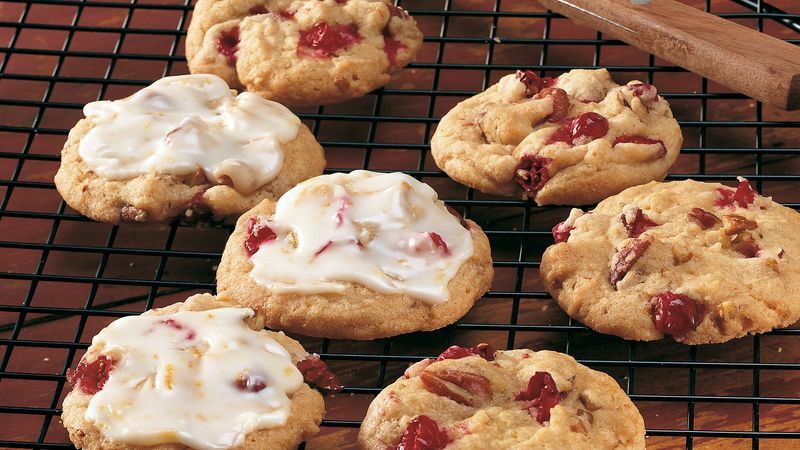 Drop dough onto cookie sheet about 2 inches apart to prevent cookies from baking together when dough spreads. Use a spring-handled ice cream scoop to drop the dough. You'll get cookies of the same size that will bake evenly.